Nothing beats a home cooked meal. It doesn’t have to be difficult to be delicious. My dad is the master of roasting chicken “Greek Style,” as we call it. I would watch him whip up this dish in about 15 minutes. It was his go-to meal while watching his beloved New England Patriots. This dish can be made with or without the potatoes. I personally love it with Greek potatoes. Pre-heat oven to 420° (Roast). Rinse chicken under cold water and remove giblets. PLEASE REMOVE THE GIBLETS! Pat dry with paper towels. 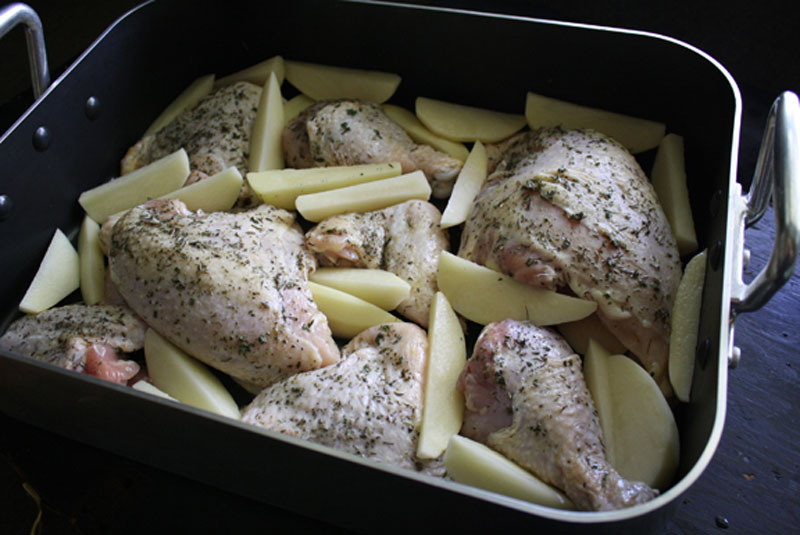 Place chicken parts in a deep, oven-proof baking dish. Cut the potatoes into long wedges and place them around the chicken as shown. Rub chicken with olive oil and season with salt and pepper. In a separate bowl whisk the lemon juice, wine, oregano, parsley, remaining oil, and garlic. Pour mixture over chicken and potatoes. Dot the butter all over chicken and potatoes. Cover with foil and roast for 35 minutes. Reduce the temperature to 375° and continue roasting about 10 more minutes, or until inner thigh registers 165°. 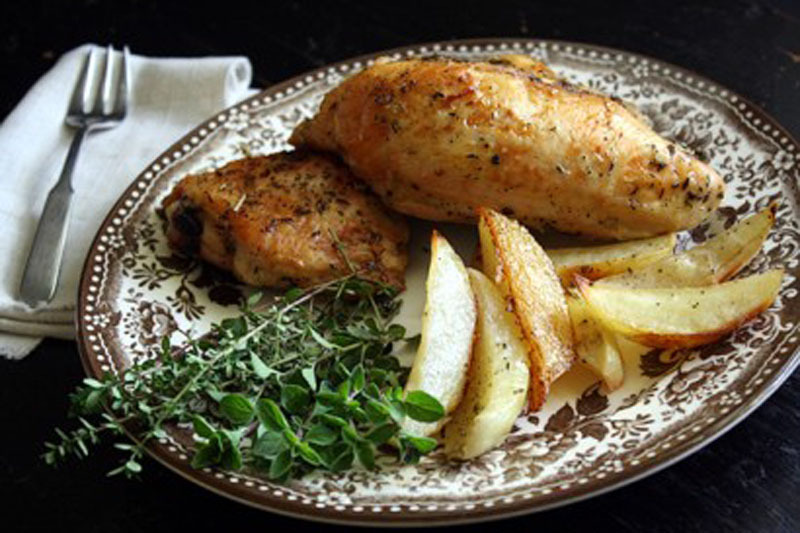 A hearty chicken and potato meal that's easy and delicious. Rinse chicken under cold water and remove giblets. Pat dry with paper towels. Place chicken parts in a deep, oven-proof baking dish. Cut the potatoes into long wedges and place them around the chicken as shown. Rub chicken with olive oil and season with salt and pepper. In a separate bowl, whisk the lemon juice, wine, oregano, parsley, remaining oil, and garlic. Pour mixture over chicken and potatoes. Dot the butter all over chicken and potatoes. Cover with foil and roast for 35 minutes. Reduce the temperature to 375° and continue roasting about 10 more minutes, or until inner thigh registers 165°. I’m an awful cook but these recipes seem easy to follow-so I’ll give them a try & let you know! Can’t wait to start!